That's where artificial grass comes in. You don't even have to replace all your living turf if your lawn is your pride and joy - just create a dedicated play area for your pooch where they can run free without any mess or stress. 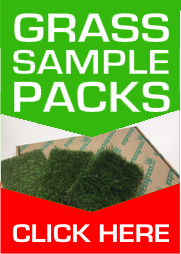 The good news is that the best artificial grass for your four-legged friends is not necessarily of the highest quality. You can use short and stiff-bladed grass that is robust and long-lasting. Those short stiff blades will bounce back much better, without the need for raking, and those coarse blades can handle the wear and tear much better than higher-quality and more realistic grasses. The reason you're creating an artificial grass dog run in the first place is because it's so low-maintenance, but don't confuse low with no. It's essential you keep the area hosed down and treated with a proprietary disinfectant once a month. Pick up any dog waste as soon as you spot it and the rest will simply hose away. It's essential that you have your artificial grass properly installed. Why? Because that way it will remain free-draining and mud-free, however foul the weather. And because you're laying fake grass to keep your dog from getting covered in mud, it makes sense to do the job properly. One of the real benefits of using a synthetic grass for your dogs is that an artificial lawn does not harbour pests like fleas and ticks. Your dog can often be under siege when he rolls on a natural lawn, but an artificial turf isn't a welcoming home for these pests. And because you're no longer using chemicals to treat and feed your lawn, your dog isn't in danger of eating something he shouldn't. Of course, using artificial turf in the garden has plenty of bonuses for humans, too, so why not call us today for more information on installing a low-maintenance synthetic lawn?